This is a general discussion of the basics of PSA, without any apps. We have more than enough apps to describe the individual steps on other pages! For PSA the rules are very different from classical adhesion. There is often no adhesion other than surface energy between layers and yet the strength of PSA can be very high (though of course they can be low if desired). The key point is that PSA gain strength through weakness. 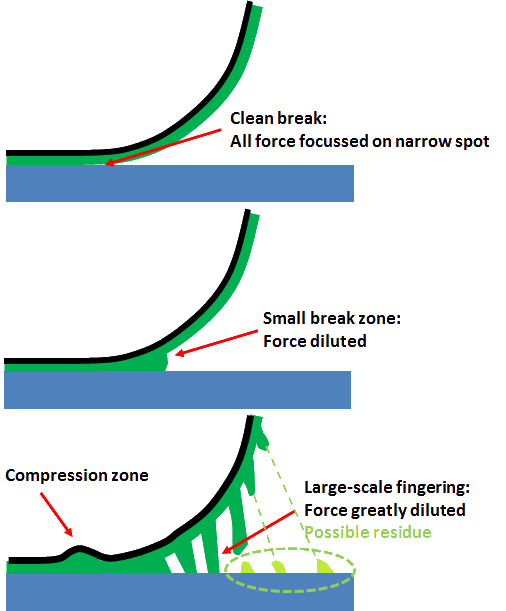 The reason they don't fail at the weak interface when force is applied is that they fail within the adhesive itself - they start to fail cohesively and by doing so absorbs all the energy that would otherwise pull the system apart at the interface. In other words, PSA gain their strength via Dissipation. The diagram shows this. 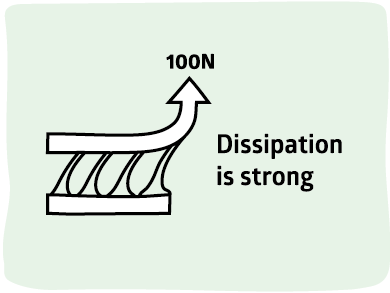 Pure surface energy is in the top, strong adhesion (middle) spreads the load over nm or μm via entanglement, PSA spreads the load over mm via cohesive failure. The relaxation time is less intuitive - a very "liquid" system responds quickly to change so τ is too short; a system with lots of long chains is going to have a desirable long τ which helps the energy to get absorbed. So, high peel comes from "strong" and "slow responding", yet a high viscosity reduces peel so a more liquid system is desired. Here we see the contradictions - high strength and low viscosity is a very odd combination of properties. As discussed in Basics adhesion science creates lots of confusion. Some talk of Peel Strength in N/m, others talk of Work of Adhesion in J/m2 others of Energy of Adhesion in J/m2. They are all the same thing! So 40N/m is the same as 40J/m2. Many users quote values as N/50mm (or N/25mm) - multiply these values by 20 (40) to get N/m - so a low peel of 1N/50mm is the same as 20N/m. Americans seem to like the strange hybrid of g/in. If we take 1in=25mm (to tha accuracy of peel tests) then you have to multiply by ~0.4 to get N/m. What's left on the surface? A key issue remains. The key to PSA strength is the cohesive failure illustrated above. But many PSA will peel off cleanly, making it look as though it was pure adhesive failure. The story seems to be that, yes, you get lots of cohesive failure as illustrated, but at the last moment the fibrils can decide to detach from the surface (giving "adhesive failure") or break in their middle (giving "cohesive failure" marked 'Possible residue'). Or, to put it another way, the speed effects which are so important in PSA show up as different amounts of residue on the substrate - from none through "stick slip" via full cohesive failure with a uniform coating of PSA remaining on the substrate. See the Strength section for more on this. The "decision" by the PSA how and when to break the fibrils is made of so many complex elements that no predictive theory seems (yet) to exist, even though there is agreement on what those elements (cavitation, elastic hardening, speed dependence...) are. A lot in PSA can be understood via the concepts of the Dahlquist Criterion and the Chang Window. They are simple and powerful ideas but in order to unleash their power we have to make a journey through some, perhaps, unfamiliar territory. First we need to understand Time-Temperature Equivalence via the WLF (Williams-Landel-Ferry) relationship. Nothing about PSA make sense without WLF. Then we have to see why we need to understand G' (storage modulus), G'' (loss modulus) and, therefore, tanδ. Combining WLF with the two G's in the context of Tg, the Glass Transition Temperature, enables most of the complexities of PSA to be understood and Dahlquist and Chang follow simply and naturally. Bringing all these themes together is the Ideal PSA. Testing is another major issue because it turns out that no single test is adequate for understanding PSA behaviour. Only then do we get on to the reasons why PSA can form such strong bonds. Here we can start to discuss whyTackifiers are good and Plasticisers are (generally) bad, even though they both make the PSA "tacky". And the use of Hansen Solubility Parameters to ensure that the tackifier is compatible with (soluble in) the base resin is discussed as a major short-cut to formulation success. It came as a big surprise to me that most hot melt adhesives are effectively PSA applied via some sort of heat extrusion. A very brief section discusses the relevant issues.